The Moreland School District announced the retirement of long-time Board Member Karen Whipple after 12 years of service to the Moreland community. In addition, the District expects an additional vacancy after Trustee Robert Varich joins the Campbell Union High School District’s Board of Trustees, a seat he was elected to on November 6, 2018. November 9, 2018: The Moreland School District announced the retirement of long-time Board Member Karen Whipple after 12 years of service to the Moreland community. In addition, the District expects an additional vacancy after Trustee Robert Varich joins the Campbell Union High School District’s Board of Trustees, a seat he was elected to on November 6, 2018. Prior to serving on the Board of Trustees, Karen Whipple has served as Home and School Club President at Country Lane, was a member of two District facilities task forces, and assisted with Music in Moreland fundraisers. Additionally, Karen has worked with Moreland students through Project Cornerstone and as a tutor and substitute teacher within the District. Robert Varich has served 14 years as a Moreland Board of Trustee and was recently elected to serve on the Campbell Union High School District’s School Board. 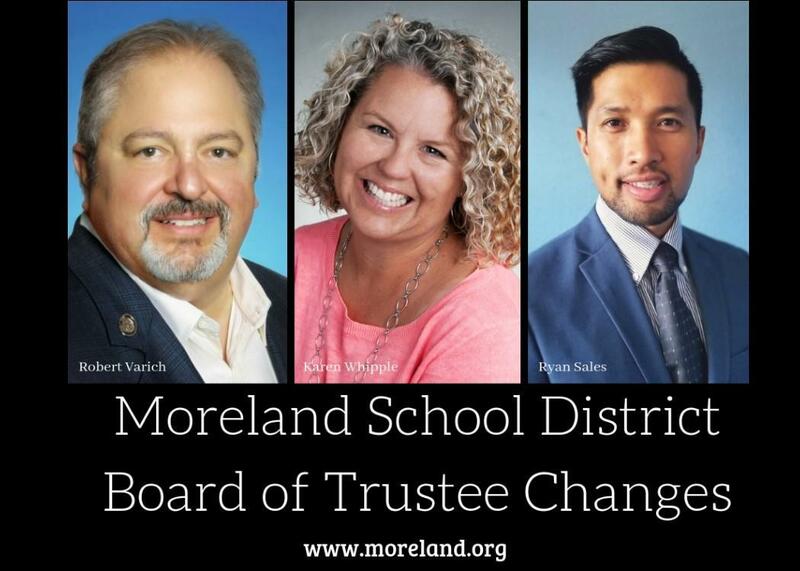 Prior to serving the Moreland Board of Trustees, Robert, a Moreland alumnus himself, served on the team that passed Measure J, The Bond Oversight Committee, and Chair of the Personnel Commission. Mr. Varich also has served on the City of San Jose’s Megan Law Task Force and as Chairman of the Appeals Hearing Board. He also served as a High School Football Coach in Santa Clara Unified School District. Under Karen’s and Robert’s terms, the Board has passed a bond in 2010, re-opened Latimer School in 2014, revised the District’s Strategic Plan in 2016, passed a parcel tax in 2017, and has won multiple local, state, and national awards for student achievement. As a result of an uncontested vacancy, Moreland parent Ryan Sales, will fill Karen Whipple’s seat. Ryan is an active parent in the Moreland community having volunteered for both Payne and Latimer Home and School Clubs, Sports in Moreland (a branch of the Moreland Education Foundation), and as a Team Manager for several years with the Destination Imagination program. Three of Ryan’s four children are currently at Latimer School, with his fourth child as a freshman at Prospect High School. Ryan is currently the Director of Physical Therapy at Advanced Sports Rehab in Campbell, as well as a clinical instructor hosting striving college students who want to reach their desired degrees in athletic training, physical and occupational therapy or medicine. Ryan occasionally guest teaches at San Jose State University’s Kinesiology department. 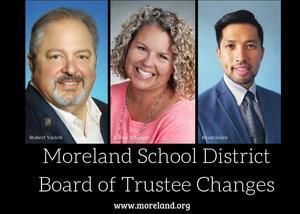 The Moreland School District invites the public to attend the November 13, 2018 Board Meeting at 6:00PM to thank Robert Varich and Karen Whipple for their dedication and service to the Moreland community. Incumbents Brian Penzel, Heather Sutton, and new Board Member Ryan Sales will be sworn in for their four year terms at the Board of Trustee’s meeting on December 11, 2018, 6:00PM.